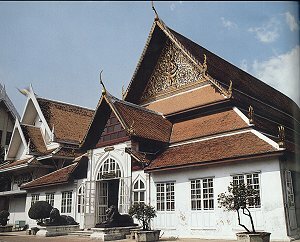 This museum is the largest in Southeast Asia and contains Buddhist art from almost every Asian country. The Thai collection covers all periods up to the present. One interesting display features traditional musical instruments from Laos, Cambodia, and Indonesia as well as from Thailand. Another exhibit has pieces of furniture used by early kings and their families. The Buddhaisawan Chapel, which was the second king's private place of worship, has a much-prized bronze sculpture of the Buddha some outstanding murals depicting his life.